Spartans plan a brand new dance and unique spirit week for the holiday season. With winter break approaching, many TJ students are getting into the holiday spirit. For the first time in many years, there will be a winter dance for students to enjoy as a way to express that holiday spirit. With a dance always comes a spirit week, so there’s an exciting line up of fun, themed days for Spartans to enjoy. 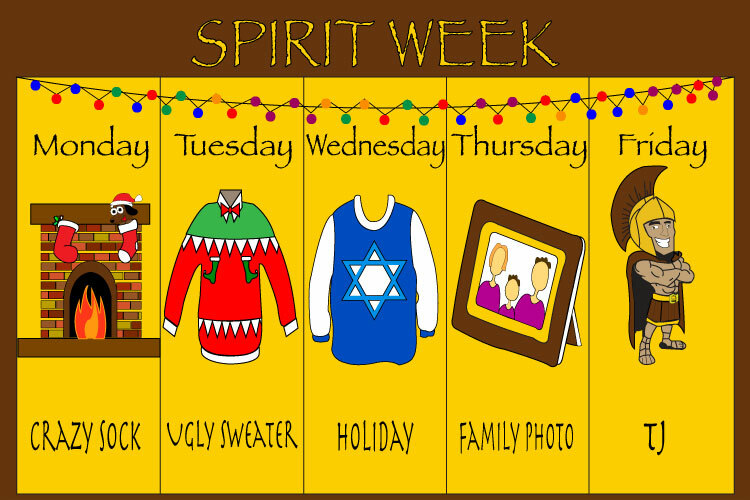 The spirit week will take place during the last week of normal classes, from December 11th through December 15th. This celebration of the holidays and school pride kicks off with Crazy Sock Monday, where students will suit up in their goofy, unorthodox or mismatching socks. Tuesday’s Ugly Sweater day celebrates a favorite holiday tradition of wearing horrendous clothing just because it’s cold outside. Wednesday brings Holiday day, giving Spartans an opportunity to dress up in the spirit of their favorite winter celebrations or holiday colors. Next in line is Family Photo day on Thursday. Being twin day’s slightly lesser known younger cousin, this day is all about dressing up to match a group of people. Finally, the last week of classes comes to an end in the way that all spirit weeks wrap up: TJ Day. This is the best way for Spartans to show pride in their school, so the building will be filled with our beloved school colors. The week wraps up with the school dance, aptly named “The Snow Ball,” on Saturday, December 16th, from 8 p.m. to 11 p.m.. Students are encouraged to wear white, blue, and silver in order to create an especially wintry atmosphere. Tickets for singles will be six dollars and tickets for couples will be ten dollars. Senior and leadership event planner Zoya Robbins said, “We wanted a winter dance instead of having only homecoming and prom. I think it’s important for everyone to be able to participate in TJ events, instead of events exclusive to seniors and juniors.” It’s certainly exciting to see such a classic high school tradition come to TJ, and this year it was leadership students who made it happen. Leadership teacher Jon Poole expressed his pride in his class, saying, “The students do it all on their own, they come up with and execute the ideas, and they have to evaluate themselves.” He followed that by showing just how student led it was, saying, “To be quite honest, I was gone when the students came up with [the idea].” Leadership students worked hard to bring this idea to life, so it’s impressive to see it come to fruition. With so much school spirit and holiday warmth in the air, this dance will be an invaluable experience for Spartans. It’s not often such a big event is introduced to the list of existing TJ traditions, so be sure to come to the dance and kick off the holiday season in style.